Join Flo and take a dash to the past and future, serving up delicious dishes in this temporally twisted Time Management game! The trouble starts when Aunt Florence tinkers with the microwave and intrepid Flo becomes unstuck in time. 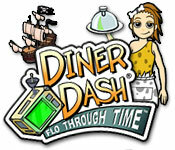 Help the workaholic waitress serve up the tastiest saber tooth burgers and cyber snacks the world`s ever seen in Diner Dash : Flo Through Time! Dash to the past and future! The Queen's Hope Diamond is gone. No one is talking. It's up to you to recover the stolen gem. You be the detective.